Ah yes, the community meal table. Communal dining can be a glorious bonding experience, as members recreate the feeling of an earlier era when the tribe gathered at the end of the day to share the fruits of their bounty. On the other hand, it can also bring out certain aspects of the cook’s personality, as sure as Myers-Briggs. Here is a sampling of the “Cook du Jour”. “Le Chef” — Before joining community, this member ran their own French restaurant. They know that presentation makes the meal, and people ooh and aah over their concoctions. Their cooking is generally well-appreciated, with the exception of people who like their green beans other than dripping with butter. “The Ethnic Specialist” — Thai, Indian, Chinese, Ethiopian-it’s a geographical whirlwind as each week we’re whisked off to another exotic food locale. The underlying theme: more spice is twice as nice. Bland is banned, so it’s peanut-butter-and-jelly sandwich night for those with sensitive palates. “Agit-Prop Cuisine” — When politics and food collide (think Chairman Mao with a measuring cup). All-vegan-all-the-time, no refined anything, no profit-mongering corporate ingredients to be found in any dish. The heart and mind can enjoy this meal, but the stomach may stage it’s own protest…. “Locavoracious” — A lighter-hearted version of the above, this cook sources their food from within 100 miles, or better yet, 100 yards of the communal kitchen. No flora or fauna are exempt, and dinner may include what you previously thought were weeds growing beside the porch or the groundhog that was last seen invading the garden. “The Mess Hall” — Prior military, cafeteria or summer camp experience informs this cook’s style. Mass-produced and designed to appeal to the masses, these meals are heavy on the mac-and-cheese, gravy-laden entrees, and all things carbohydrate. Regardless of style, as we sit down to a meal together in accordance with our own community traditions–be that thanking the cook, saying a prayer, or simply digging in–we can appreciate that the simple act of sharing food is an important part of the “community glue” that holds us all together. Bon Appetit! Valerie Renwick has eaten more than 13,000 communal meals over the course of her membership at Twin Oaks Community in Virginia. For those who don’t know about cob, it’s an ancient building material made by mixing sand, clay, and chopped up straw. It’s cheap and requires not equipment or skill to make, and has the great advantage of holding heat or cool incredibly well. It’s also a very sculptural building material. Just try a Google search of ‘cob house’ and you’ll see what we mean! 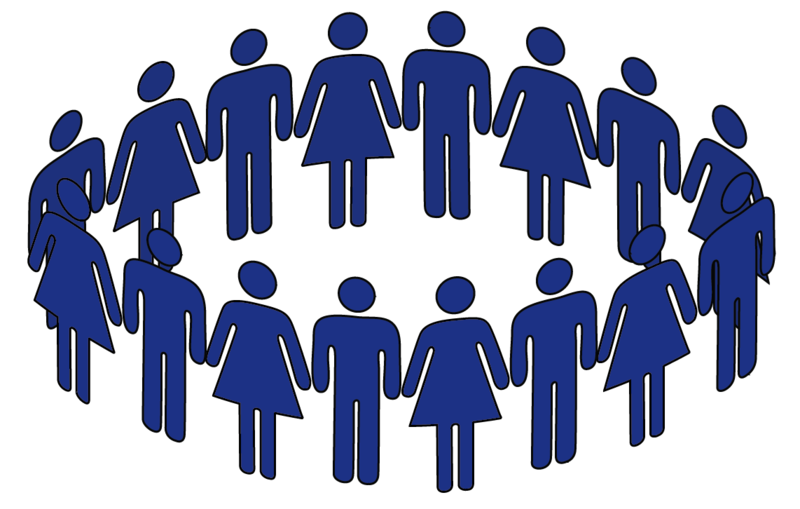 Every community, like an evolving organism, is informed by its genetic past and adapted to its current environment. Such is Cambia, a newly formed income sharing community in Louisa, VA.
Why start community when there are so many already? When some of those communities aren’t even full and are looking for members? There is a niche to fill in the ecology of community, and without it, the ecosystem is not as resilient. What is this niche? To some degree, we have not wanted to define Cambia. We have wanted to let her slowly develop her own vision. We have also been focused on how we are being together, not just what we are doing together. We want the how to be as important as the what. But slowly, with the help of offsite members and supporters, Cambia’s vision is becoming more and more clear. It is our hope, however, that Cambia will continue to be flexible and evolving, using our collective values to guide us rather than some end goal. So what part of Cambia’s vision is developing this clarity? For one, Cambia hopes to become a permaculture education center. It will be a hands-on, interactive, and inspiring day camp for children or novices to learn about permaculture in the most intuitive, practical and enjoyable way. And we don’t just mean gardening. We mean incorporating permaculture principles into the whole of the natural ecology, as well as the social and cultural ecology. We mean taking a design science and applying it, while also encouraging and inspiring others to do the same, in their own home, community, city, rural land. There are ways in which a widespread application of permaculture could mean supporting all the inhabitants of the earth in a healthful and sustainable way. There are ways that permaculture can help to remediate decimated ecosystems and slow global climate change. Although we are working on this locally and not globally, the long term and overarching goal is to affect some change in this direction. The education center (which we are calling the Living Systems Exploratorium) is an answer to the question of how to have a business that has a strong symbiotic relationship with the community. The more Cambia grows into her full self, the more her business would naturally thrive, and the more the business thrives the more it would support the community becoming her full self. The business is still in its infancy as well, but will hopefully grow as does Cambia. Currently, we are hosting workshops and work parties to allow people to come and experience natural and alternative building, and will continue to host workshops as we develop. Applying permaculture principles to garden and landscape seems simple (read Gaia’s Garden to get an idea of how that works, if you are unfamiliar with the concepts). It isn’t simple, it is incredibly complex, but the basic ideas can begin to be worked with and applied easily. In comparison, social permaculture is incredibly elusive in application. But here we are, at Cambia, trying this as well. One basic principle of permaculture is stacking functions. Community is already efficient in that just the act of sharing reduces negative environmental impact (use of fossil fuels, etc.). We are interested in more than that. Living communally answers a need many of us feel for meaningful relationships that are held together by the day-to- day experience, not separate from it. So if we are going to live together, we might as well stack functions and be good friends. (This may seem obvious if you haven’t lived in community before, but it isn’t always how it works.) So we are intentional about the time we spend together, whether in work, play, dance, meditation, or focused conversation. We value stretching our own interests to support each other’s passions, to be inspired by one another. And this is one niche that sets us apart from some other intentional communities: bringing intention into our relationships acts as a community glue that keeps the community from stagnation or collapse. Another permaculture principle is “the problem is the solution.” This is applicable to our view on families and children. Some communities might view children as a burden. They can only accept a certain number of children because of the labor load the children require, and most people aren’t seeing the benefit. Well what is the benefit? We love kids. We are inspired by their curiosity. We are teaching them to be good people. In some ways, everything we are doing is for the next generation. Of course it is for ourselves as well, but we are working hard to provide a better world for our children. We want to incorporate them into our work. We want our work to be fundamentally understandable to children. Shelling beans, planting seeds, drying fruit, chopping firewood, building with clay and caring for livestock. Many of these jobs are too tedious or boring for grownups to do, but can be challenging for kids, and much more fun when doing them together. The particular gift of children is that they “force” the adults to slow things down, to explain things, and even to celebrate more, get in the kiddy pool, jump on the trampoline, etc. Another benefit is that it gives a real job to the teenagers or to visitors of your community. Whereas teens might feel disinterested in the workings of grownups or constantly want to escape into the virtual social world, they generally do not neglect their babysitting duties, and often have more energy and playfulness than grownups do. Visitors are often enchanted by the degree of independence, maturity, and knowledge of community kids, and gives the kids a chance to shine and impress the visitors, while the visitors get to offer real help by watching over the kids. In wanting Cambia to be an ever evolving community that tends towards its goals of social harmony and positive ecological impact, we are brought to our third goal. 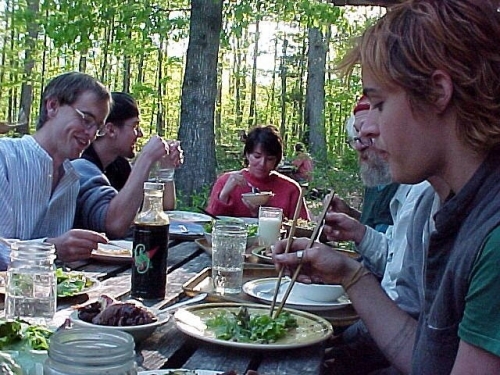 We are forming a research institute for the study of intentional communities. We are gathering academic affiliations and intentions to create a working group and a conference place to focus scientific research that could help us understand the basic question of: “If communal living is so obviously the natural and good way to live then why is it so hard?” We are hoping the further research of this subject will help to inform Cambia as well as any other forming or established intentional community. So what are those values that are informing our direction and vision? We do value work, insofar as it brings our ultimate goals of creating the homes we feel good about and the educational center that brings us ideological fulfillment. But more, we value the relationships between people, our children, art and creativity, spiritual practices, and supporting each other’s passions. Sometimes it is all too easy to focus on work and progress, but in doing so, we might forget our other values. Cambia is intentionally creating space and time for these values to be held and nurtured, for creativity, ritual and love to be cultivated. And yes, we have to finish the barn. But yes, we will also devote time to making puppets and telling stories. My answer: With democracy as with science and as all of life, there are mechanisms in place to encourage evolution or at least prevent decay. Without those mechanisms, intentions might not be sufficient. So here at Cambia we put in place social and cultural mechanisms for our success. Cambia seeks to provide ever evolving answers to the question of what the mechanisms are. That’s right, no specific answers. Answers can turn into dogmas. So what is Cambia? Cambia community is fundamentally about growth and evolution. An ever evolving community with strong values and ideology, where we grow as individuals and as a collective, just like the cells that make up the cambium of a tree: inherently life-giving and flexible. The most life happens on the edge. Between xylem and phloem, between bark and wood, between work and play. Work brings the slow, steady rooting and strength, play brings the nutrients, energy, and light. I’ve been thinking about some of the invisible threads that make this place feel like community to me. Last weekend I reupholstered a chair. The knowledge came from the internet. The gist of it is this: get a staple gun and both kinds of screwdriver. Pay attention when you take everything apart. Go slowly. Use the old pieces of fabric as your pattern for anything new. Once I had this information, I felt equipped. The fabric came from a give-away pile outside the room of a member who recently left. The screwdrivers and the first staple gun came from our shared woodshop. The staple gun, if it stapled at all, did so once in between two or three trigger squeezes that pushed out three mangled staples at a time. But I also knew that the good people of Nashoba SLG have a little stash of tools in their laundry room, and there indeed was another staple gun. A better size, actually, and with a bunch of extra staples. The zipper for the cushion came from Commie Clothes. There were lots of zippers there, so I picked the best match in size, color, and apparent durability. The sewing machine that I used (and currently own) came from another ex-member, who passed it to me while she was still living here, when she came to terms with the idea that she would never ever use it (I love it so much! It’s the same one I used to make the quilt last year). In our big common space that gets used for yoga, movies, feedbacks, piano practice, and kids going nuts on rainy days, I took the gross chair apart. I cleaned the mold and grime off the wood with vinegar from the mop closet in the kitchen, and vacuumed up the grit that fell with the killer new vacuum House just recently magicked into our vacuum closet. After fixing the chair’s arms and cushion cover, I realized that to sew the back portion, I’d need some monofilimant thread. Picture doing this project in your own home. If you are not a) a professional upholsterer or b) a pack rat/hoarder, it is unlikely you have every single item I’ve listed above. You have to go to Home Depot, or Michael’s, or Wal-Mart, or whatever. You have to go get in your car, drive to the big box, pay someone some money, and then come home with something you might use again but maybe you never will. Of course, it’s nice to have a staple gun on hand, and screwdrivers, and a sewing machine, and upholstery fabric, and white vinegar, and extra zippers, and a killer vacuum cleaner. So maybe you do have all that stuff, or see the having of it as an investment and don’t mind that much going to Home Depot to buy it and be its owner. I got stuck when I got to the monofilimant. This is a very thin, clear nylon thread, like delicate fishing wire, that is used in quilting appliques. I don’t have any, and there was none in Commie. So I asked Valerie, who has done some quilting. She had some, but it was the wrong thickness. I decided to ask Pam, who is an accomplished quilter. I went to her room, did not find her, and left a note. On the way back to my house I ran into Madge, another member who often sews and has done plenty of fabric art. Madge confirmed she had some and gave me permission to rummage around in her stuff to find it. She even took the note away from Pam’s door for me. And thus I finished the chair back. Then I put everything back together. I used the battery-powered drill that lives in our laundry room. When I needed some stiff wire to thread through the back of the chair, I found some at Nashoba again. I restapled everything and screwed it all back up. And voila. Obviously there was not quite enough of the nice fabric, but it was enough to make the chair not gross anymore. 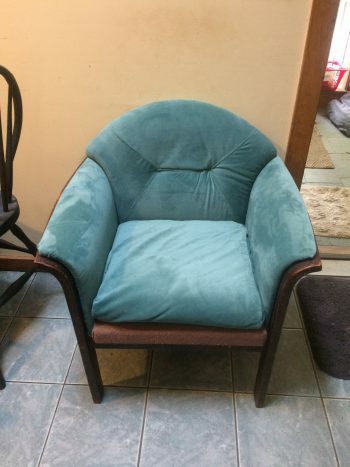 Many sites out there give quotes on how much it costs to reupholster a chair. For me, it was free. I didn’t have to go anywhere or buy a single thing. We had 100% of the materials, tools, and supplies here on the farm. I didn’t even have to use the tripper system. I like having some things around in my own possession, stuff I don’t often use, but I have quickly on hand if the need arises: binder clips, watercolors, a glue gun, a microwavable bowl with a lid that fits, a leatherperson multitool, a quilters’ ruler, hobby knives, some schmancy paper. When people borrow this stuff from me, I feel great! I like getting to pay the universe back for borrowing so much stuff from others. 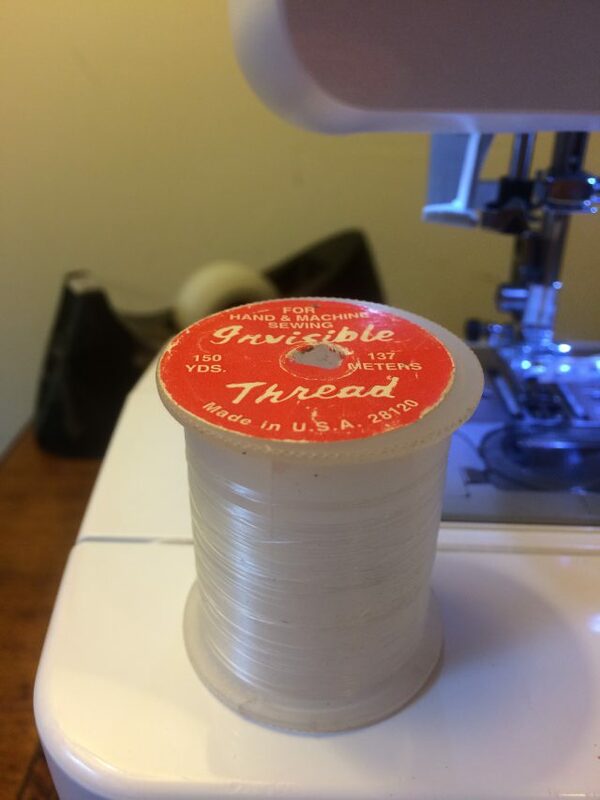 So, the invisible thread is…Yep. Commit to deep listening: I am guessing 75% of relationship problems could be solved if people really focused and listened to each other. This means not getting stuck by our past scars and holding on to a compassionate mindset. There is an art to deep listening and it is not enough to just sit quietly, committing to learning this skill and applying it regularly may be the longest lever you have for building community. Commit to self reflection and critique: If there is a problem in the romance or the community, you have a part in it. It might be an apathetic part, where you are not willing to help someone who you see struggling. In an intentional relationship we are all committed to fostering the well-being of ourselves and the others we are dancing with. Part of this has to be admitting our faults and a willingness to work on them. Commit to not stewing: If you are upset with me, come tell me. Don’t talk to someone else who might be struggling with me and tell them the thing that i did which frustrated you. This is an anti-gossip norm thru fast remedial action. The trick is how do we keep these types of agreements? Getting together, face to face, creating a safe and comfortable environment and talking or doing other types of trust building exercises together. My personal favorite flavor of this is transparency tools, but other techniques include clearnesses, Nonviolent Communication, and Co-Counseling. Different tool sets fit different cultures. In the Point A work we advocate for the transparency tools, because most of them are “soft tools”, meaning that an amateur using them is unlikely to hurt themselves or others in the group. This contrasts some more daring and powerful communication tools (ZEGG Forum jumps to mind) which can do amazing work, but if operated by people who are not yet experienced or are clumsy can result in people getting emotionally or psychologically banged up. When considering a set of communication tools it is often wise to look for versatile tools like the Clearness technique used at Acorn, which serves both as a regular universal check in and connection building device and something to be used when there is an acute problem with a member. You can’t make a honeymoon last forever, but good communication practices will provide resilience and functionality to your community and your relationships.